Ready to try your hand at the jeweler’s bench? Whether you need a refresher from your high school jewelry class, or are a total beginner, I can help you learn how to make your own jewelry. Choose between community art center classes, weekend workshops on specific topics, or private, individualized lessons. There is something for everyone! Jewelry Open Studio at North Seattle College – Students who have already taken at least one beginning class may sign up for this class to gain additional lab time and mentoring. Bring your unfinished projects from a previous class or your new ideas; I will help you complete them and show you new tips and tricks along the way. The students in this class range from novice Beginning Jewelry students who want to keep going with what they’ve learned, to experienced artists who want to hone their skills and keep using the college’s well-appointed studio. Class meets on Wednesday nights from 6:30-9:30pm, plus eligibility for drop-in Saturday time when offered. Next session starts June 27th; sign up directly on the North Seattle College website. Beginning Jewelry – For total beginners, and those who need a refresher; this class can be repeated for more studio time. Students will learn to cut, bend, hammer, solder, and polish metal to make rings, earrings, pendants, chains, and more. We will also explore basic stone-setting and students will have the opportunity to bezel set a cabochon stone. Mechanisms: Hinges and Clasps – Weekend workshop. Learn how to add movement and functionality to your jewelry creations with this fun and challenging class! Silver Filigree – Weekend workshop. 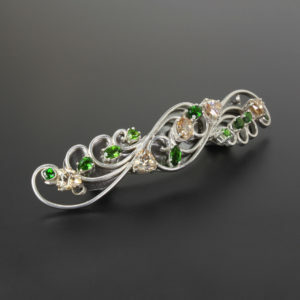 Learn to construct delicate, beautiful silver filigree. This class will improve your soldering skills and your wire-working technique, and get you thinking outside the box as we construct these amazingly light and strong jewelry elements. Private Lessons – If you are looking for 1-on-1 coaching or want to learn a specific skill or technique, private lessons might be right for you. Held in my jewelry studio in Pioneer Square. I can accommodate up to 2 students per session. Contact me for details. Home Studio Consultation – Need some expert advice on setting up your own studio? I am available to do an assessment of your space and your existing equipment, to help you identify any gaps in your set-up and plan what tools to buy next — and possibly offer some tips for how to use what you already have or can readily get. Send me a note and let me know you need a house-call.